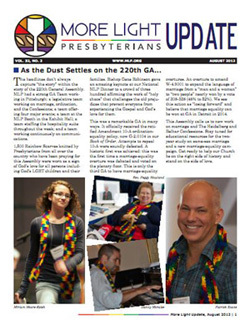 In addition to this website, More Light Presbyterians creates dedicated sites to document our work at General Assemblies and during ratification campaigns. Our former website is archived at http://archive.mlp.org. More Light Update is our print publication mailed twice a year. To receive More Light Update, sign up on our Join as Individual/Couple page. More Light Update issues going back to 2004 can be viewed in our library on Issuu. HTML versions of More Light Updates going back to 1993 can be downloaded in a zip file. MLP News is our email newsletter and goes out twice a month. To receive MLP News, sign up on our Join as Individual/Couple page. We encourage media coverage of More Light Presbyterians’ events. We seek to maintain a balance between legitimate media access in the interest of accurate reporting, while also respecting the privacy and confidentiality of the participants at More Light Presbyterian events. All media representatives are required to agree to be bound by this policy, register, receive, and display media badges. More Light Presbyterians reserve the right to verify the credentials of all proposed media representatives, and to deny or revoke access in its sole discretion, at any time. All media must wear their media badge so that it is clearly visible at all times. In addition, all media must verbally identify themselves as media when entering conversation with event participants or leaders. Subject to this policy, media representatives are welcome to participate in plenary sessions. Small group workshops, question and answer sessions, and covenant groups, are not opportunities for media reporting or participation. Permission from MLP is required for photography, videotaping or audio recording More Light Presbyterian events or the participants of MLP events. Media representatives wishing to schedule interviews or clarify this media policy should contact Alex McNeill, Executive Director at (505) 820-7082 or alex@mlp.org. More Light Presbyterians adheres to Facebook’s Community Standards for all our social media sites. Any communication that violates these community standards will be removed and/or reported to the relevant social media site. 1) Personal Information. Your name, address, phone, email, church and presbytery information will never be sold to third parties under any circumstances. When our mission does require sharing data with third parties as part of our commitment to justice for LGBTQ people in church and society, the limited use of data is approved by the MLP National Board of Directors. You may permanently opt-out of having your data shared with board-approved third parties by making the request to privacy@mlp.org. 2) Financial Information. Your donations to More Light Presbyterians are never shared with third parties under any circumstances. Our financial assistant is aware of donations for accounting purposes and information is shared in a limited way with other staff and board members when thank you calls need to be made or donor research is done. You may permanently opt-out of having your financial data shared with staff (excluding the financial assistant) and board members by making the request to privacy@mlp.org. 3) Marketing Information. Your visits to and from the MLP website, social media sites and Vertical Response emails are tracked to assist our communications team. This information is shared in aggregate ways that do not reveal individual identity with the staff, board and our funders. There is an opt-out button on each Vertical Response email or you may also opt-out by making the request to privacy@mlp.org.